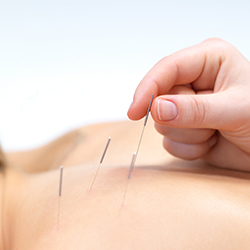 Dry needling focuses on the treatment of myofascial (muscular) trigger points. Dry needling targets the trigger points within the muscle rather than traditional acupuncture targeting the meridians. Trigger points are known as trigger sites or muscular knots which can cause a level of discomfort and pain. Dry needling using acupuncture needles to be inserted into the skin and muscle directly at a myofascial trigger point. Deep tissue massage will be carried out first to warm up the effected muscles and to help identify the placement of the needling’s. In some cases a Transcutaneous Electrical Nerve Stimulation (TENS) unit will be attached to the tops of the needles to help restore a normal neuromuscular stimulation to the trigger point resulting in a release of tight muscular fiber/knots. The increased blood flow that will be present during and after the treatment will provide good oxygen and help remove any waste products.